A woman undergoes an electroencephalogram (EEG) test. The human body is an electrochemical organism, although the electrical activities of the body are relatively weak in contrast to electrical appliances. Although weak, the electrical activity of the human body, particularly that of the nerves, can be measured. The brain is especially active in this regard, and electrical variations can be measured by means of electrodes taped to the head and face. The machines used for this purpose produce what is referred to as an electroencephalogram, or EEG. When recorded on a roll of paper, EEGs produce what looks like a wave pattern, hence the expression brain wave. Different stages of sleep are characterized by different brain wave patterns, and contemporary laboratory sleep research relies heavily on EEG measurements. 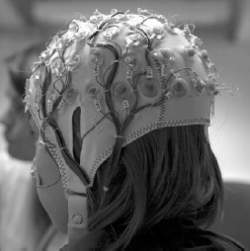 And while techniques like fMRI -- which measures brain activity by detecting changes in blood flow -- can grab finer details of what's going on in specific areas of the brain, EEG has greater practical potential given that it's more common, portable, and inexpensive by comparison. Habiba Al Marashi, chairperson of EEG, said the role of the organisation to protect and preserve the environment has been effective for 26 years. Initially, a full 20 min baseline EEG recording was obtained, which was used for comparison with test recording. Alguns estudos demonstram que o EEG nao e um exame adequado para avaliar pacientes assintomaticos, visto que possui baixa sensibilidade e especificidade nesses casos (8). In 2004, a prospective case series study[sup] in the United States of 34 cases with subarachnoid hemorrhage (SAH) (Hunt-Hess Grade 4–5) demonstrated that among patients with delayed cerebral ischemia (DCI), 24% had an alpha/delta ratio (alpha energy/delta energy) that was relatively decreased compared to the baseline (as assessed through quantitative EEG monitoring [qEEG]) (Evidence Class IV). Also, the new RD SedLine EEG sensor features a repositioned, color-coded sensor-cable connection that lies comfortably on the patient's head and soft foam pads to reduce discomfort upon application to the patient. The simulation of brain activity for acquiring the desired EEG signals is accomplished by voluntary eye blinking. The BSS algorithm is applied to the EEG sample under four different cases such as an EEG signal of a sleep recording, a stereo file containing an EEG signal and EOG signal, an EEG signal of the recording of an apneic patient and a stereo file containing two EEG signals of a sleep recording. Photic stimulation and hyperventilation were used during the EEG recordings. An important advance is the evolution of EEG acquisition devices. EEG was done for each subject at two settings for each subject in the department of Physiology.